Merry Christmas!! Since most of you are probably reading this after opening presents and all that other good stuff, I figured it was a tad too late for another Christmas themed project. However, it would be just in time for a New Years Eve project! 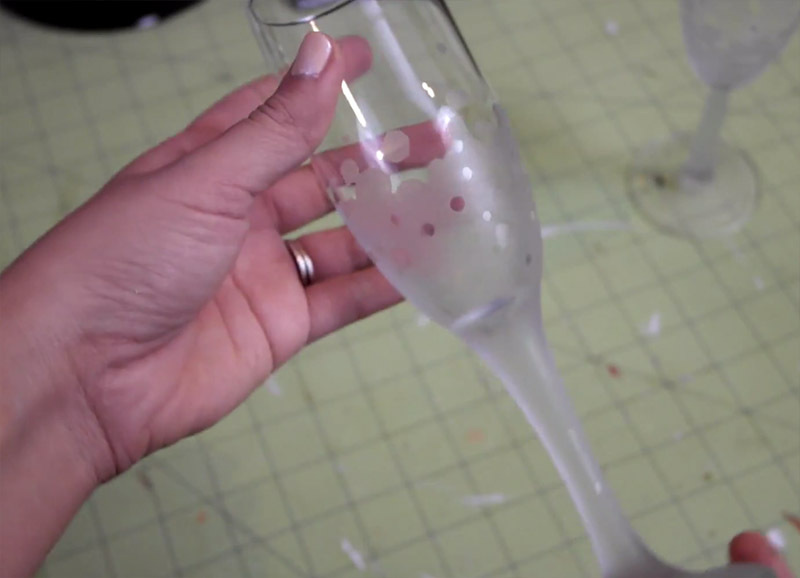 So for this week I'm going to show you how to etch some glassware to make some pretty cool looking customized champagne flutes. You could make some as a gift for the host of the New Years Eve shindig you go to, or you could even make them as party favors for guests for your own party! Supplies. Use a sharpie marker to rough out your design. I wanted to do a bubbly design. Use the puffy paint to block out the areas that you don't want to be etched. Apply it a bit thick so it will be easy to peel off later. Let dry. Here's what my champagne flute looks like after blocking everything out. It looks a little confusing, but essentially I'm going to apply the etching cream to the bottom half of the glass, carefully "coloring" inside the lines around the middle bit. Apply the cream in a thick layer with a foam brush. Also you should be smarter than me and wear gloves while you do this. This stuff is etching glass, imagine what it could do to your skin. Let the cream set for a few minutes. I've seen people say that they let theirs set for as little as one minute, but I let mine set for the long long time of about 20 minutes. Rinse off the cream under warm water and soap. Let dry. Peel off the puffy paint. This part is so satisfying! Admire your work! I hope you all enjoyed this project! You can totally do any design you want to do this. You don't have to limit yourself to only New Years designs if you didn't want to! Also, there's still time, so don't forget to enter my giveaway!